Billionaire, Secret Lover and Omutambala music videos are available now. Rob Prophet drops PROF 005 Billionaire Exclusive Album on 26th Dec 2018. On 1st May 2018, Black Prophets Music Records management, called in Rob Prophet & The Prophets Music Band into the rehearsal rooms. The main objective was to rehearse the new 15 track PROF 005 Billionaire Music Album. It was calculated that Rob and the band will rehearse all the 15 tracks in 5 days. Hence the mission was executed successfully. Rob and The Band together with the executive producer Thuthukani Cele, did all the 15 tracks in the rehearsal room to perfection. The following week, Rob and the band proceeded to the studios where magic was observed. 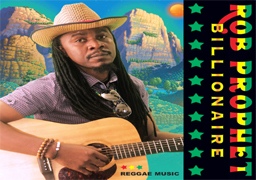 The Classic Billionaire was recorded for 3 weeks by Oyama Songo. The following week the raw material was sent to Forest Studios for mixing and Mastering. Our Sound engineer, Dave Segal requested for enough time to do mixing and mastering. Dave used all the expertise to make sure that Billionaire is welcomed by the world as an Exclusive Release. Digital Eikon designed PROF 005 Billionaire album sleeves, thanks to Chantal. Black Prophets music records, at the same time had to engage the copyright companies like SAMRO and CAPPASO to protect the content. After the copyright was done successfully, the office of Black Prophets Music records, forwarded the CD to the manufacturing plant House of Print where the album had to be prepared for printing. Billionaire album was released on 26th Dec 2018 in more than 350 online music shops. The Album will officially be released in South african local shops, early febuary whereby the massive album launch will also be arranged. For physical Billionaire CDs, make an order to Black Prophets Music Records, or you can as well contact Amazon for any quantity you need. We give thanks and praise to Jahweh, and we shall always maintain One Love... Peace be upon I n I. Due to poor organization, Black Prophets Music Management cancelled the 20th Sept 2018 Rob Prophet and The Prophets Music concert. Rob and The Prophets were supposed to perform in Lesotho Maseru at Victory Hall. We apologise to our fans and friends who got disappointed. The message from the management is that, we are always committed to good competitive performances, and it is that we shall maintain without compromise. The shows cauncellation is not due to our management failure to deliver our musicians, but there so many parties involved to make a successful show. World Aids day Dec 2018 saw Rob Prophet & The Prophets Music band Live in Watergate. It was a blazing sound and uncompromised crowd as the Prophets did what they do best. As usual it was Reggae Music Art and Culture. We saw Children get natty as they bubbled on Jah Rythms. We thank everyone for the wonderful time. It was Reggae Music that Cape Townians wanted and indeed, Black Prophets Music Records stood at nothing, but deploying its 13 Piece band whereby, they played in Khayelitsha and Rogelland Farm respectively. It was a 2 hour and 30 minutes show and The Prophets played more than 15 songs, of their own original compositions leaving revealers yawning for more. The continuous action and energy did not spare any of the critics, because Black Prophets Music Records guaranteed a competitive performance.